An award-winning performer known for his reggae music, Jamaican artist Nesta Robert “Bob” Marley was revived once again by the student-based Bob Marley Ensemble at the Berklee Performance Center on Feb. 2. 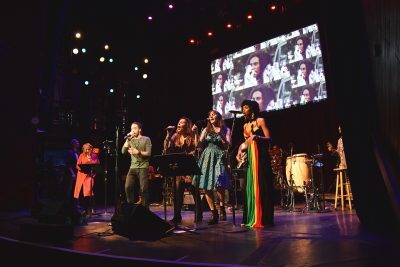 The 40-year anniversary of Bob Marley’s “Exodus” album was celebrated with passion and pride, as a select group of talented Berklee College of Music musicians used the power of their voices and instruments to recreate Marley’s vision. The performance featured a special guest, Vivien Goldman, a musician, writer and expert on “post-punk” reggae culture who is known as the “Punk Professor” at New York University. Through punk, Goldman said she found an “opening of the door” in what she deemed a patriarchal music business in the late 1970s and early 1980s. This genre of music was “very freeing, for all the girls, the Slits, the Raincoats,” Goldman said. Matt Jenson, the director of the Berklee Bob Marley Ensemble, also joined the stage with Goldman. Jenson started a class titled “The Music and Life of Bob Marley,” where he works closely with students to intensively train them in preparation for the honorary performances. His ultimate goal is to turn his students into “musical and human revolutionaries,” he said. The ensemble not only performed the “Exodus” album, but also addressed the political turmoil Marley himself faced and overcame in the 1970s. Viewers experienced the full reenactment of Marley’s life and the pinnacle of his music career. By the time they’re ready to perform, Jenson said, the students know more about Marley’s life and activism than most people on the planet. Goldman continued to elaborate on the conflicting tones of the two sides of the record, referring to the vinyl days when one side was considered the more popular, mainstream sound as opposed to the other. It was clear during the performance that Marley managed to propel his thinking to popularity and produce an “anti-elitist” sound. Goldman, Jenson and the students collaboratively captured this ongoing struggle and the essence of Marley in one powerful package, said Beth Butler, 68, of Wayland. Alondra Ladd, a sophomore at Berklee and a current trainee of the upcoming Berklee Bob Marley Ensemble, commented on the profundity of the show as a whole. But Jenson’s motive behind creating the Marley class stretched further than the history of a musician.